As the title says: 1965-83 GM 105amp 3 wire Alternator swap. This may not be exact for those who are running a stock Carburetor because of the choke but this write up may help. This write up will consist of a 2.2 EFI B. My stock Alternator had a connector with 2 wires and the bolted wire to the battery. 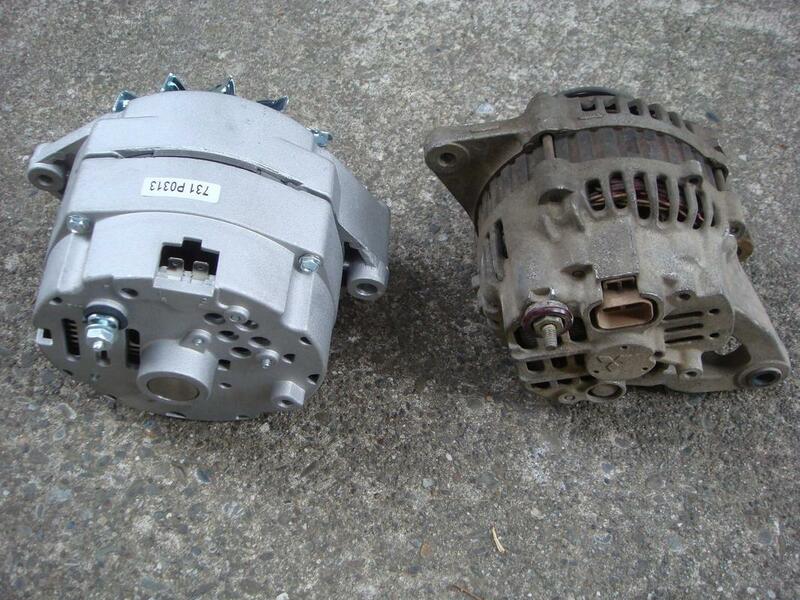 I have recently done a GM 3 wire alternator swap and took pics during my install. Disclaimer: I hold no responsibility for work done following this write up. It worked for me. Read thoroughly before doing any work. 2. 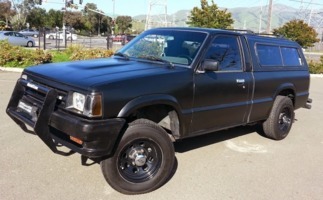 Disconnect the stock alternator connector and also unbolt the main power wire from said alternator. 3. 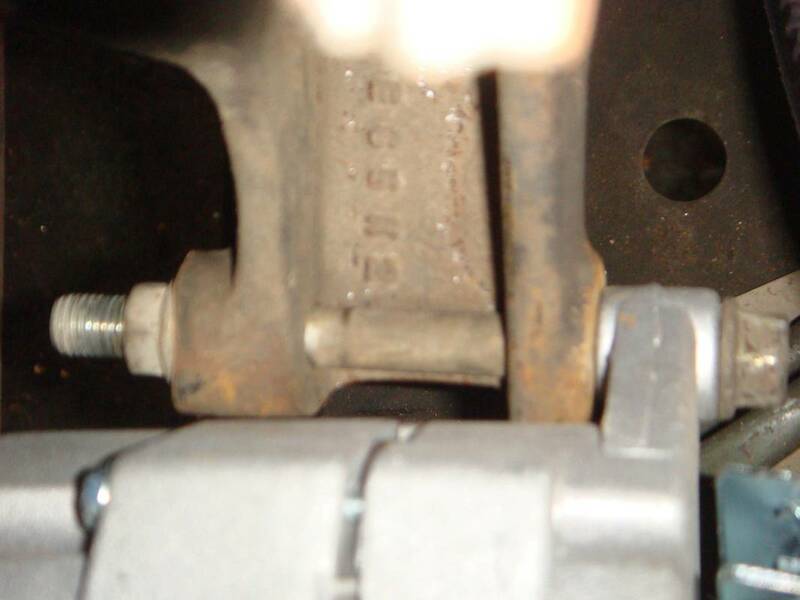 Remove the upper alternator bolt at the bracket. 4. 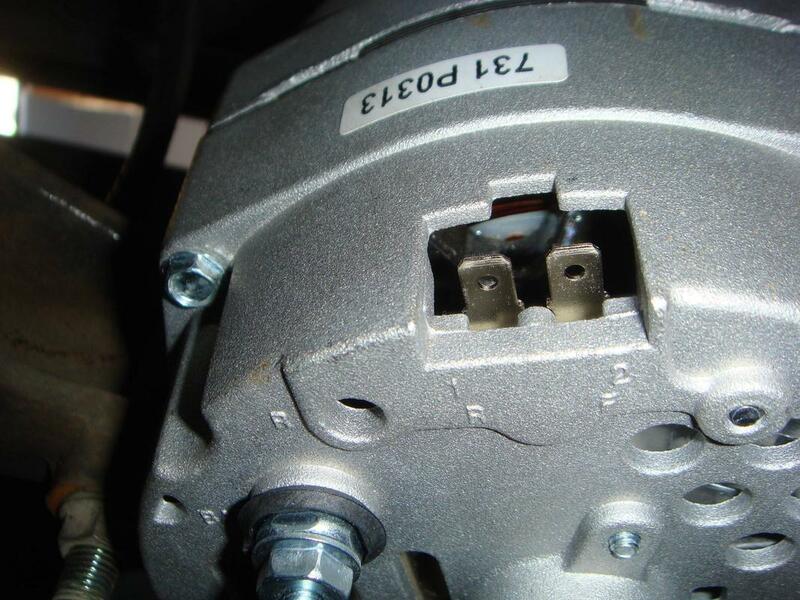 Loosen/remove the lower bolt/nut from the alternator and pull the alternator out of the engine bay. 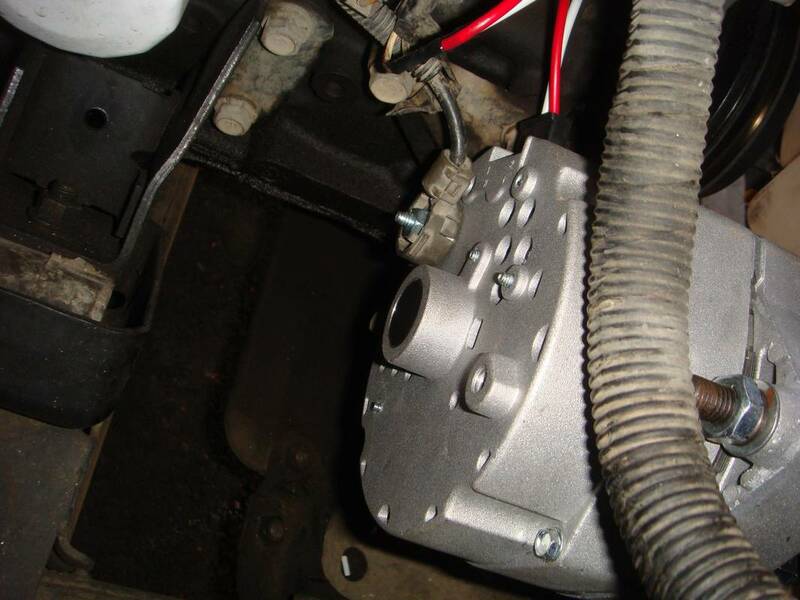 Also remove the alternator adjustment slider bracket off the block (obviously the belt too). 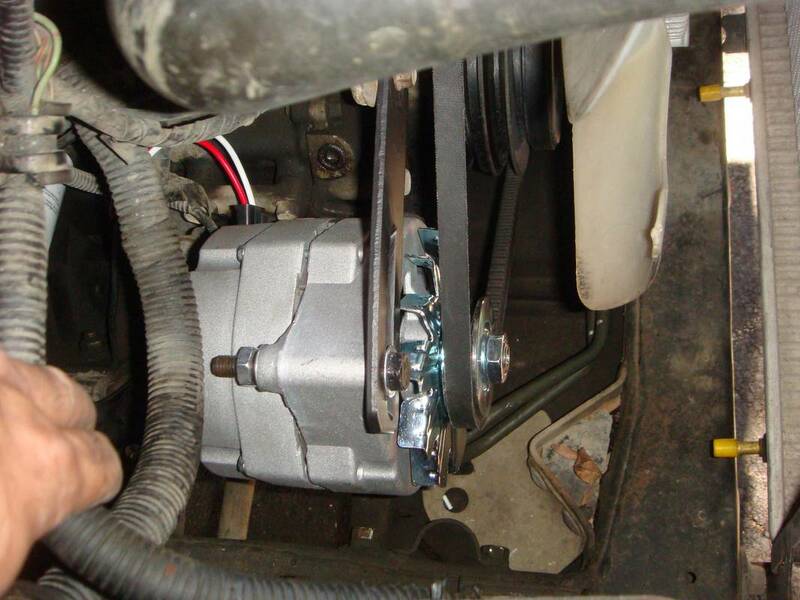 *if you have power steering you must also remove that belt to get the alternator belt off. 5. 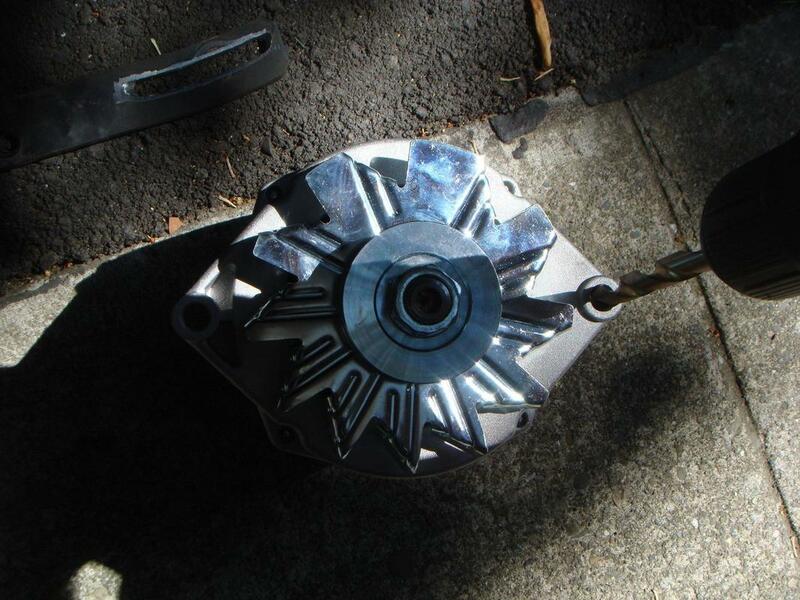 You will be mounting the new alternator upside down so a small mod needs to be done to make it work. With your drill bit set find the correct size that the stock lower alternator bolt will fit through (the long bolt). I don't remember the exact drill bit size. 7. 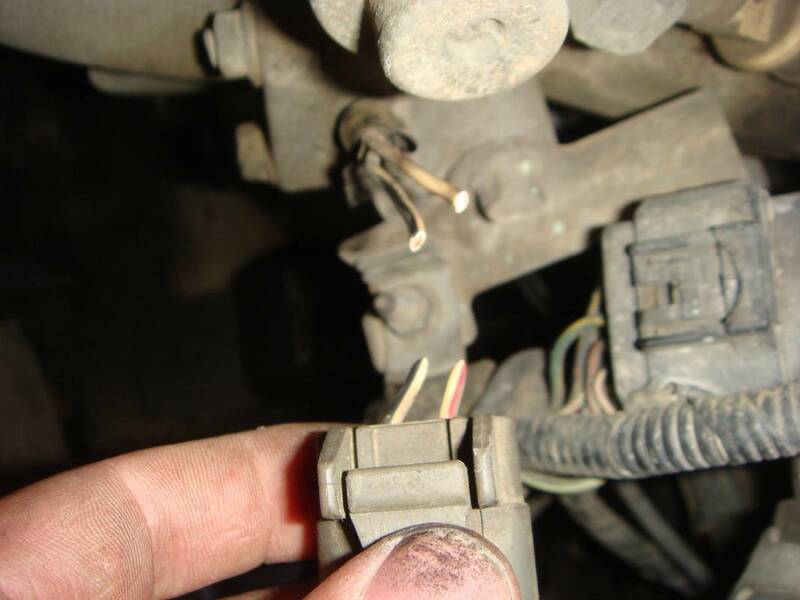 Now would also be a good time to widen the slot of the stock alternator adjustment slider bracket. (I used a hand held disk grinder, a dremmel will work or a grinding stone tip for a drill too but it will take longer) This will hold your new grade 8 - 3 inch long bolt. so make sure the bolt will fit/slide through the entire length of the slot you are widening. Again, make sure the bolt fits through the entire length of the slot. Spray Pant it to prevent rust. 8. Now it is time to solder in the new $2 GM 2pin connector to the truck, for the new alternator. 9. Cut the stock alternator connector off the wiring leaving some wire to work with. 10. Temporarily connect the battery. Use you Multi-Meter/ test light to determine witch one is 12v constant and which one is switched on with Ignition. Wire colors may be different but for mine the white/red is 12v constant, white/black is switched Ignition source. 11. 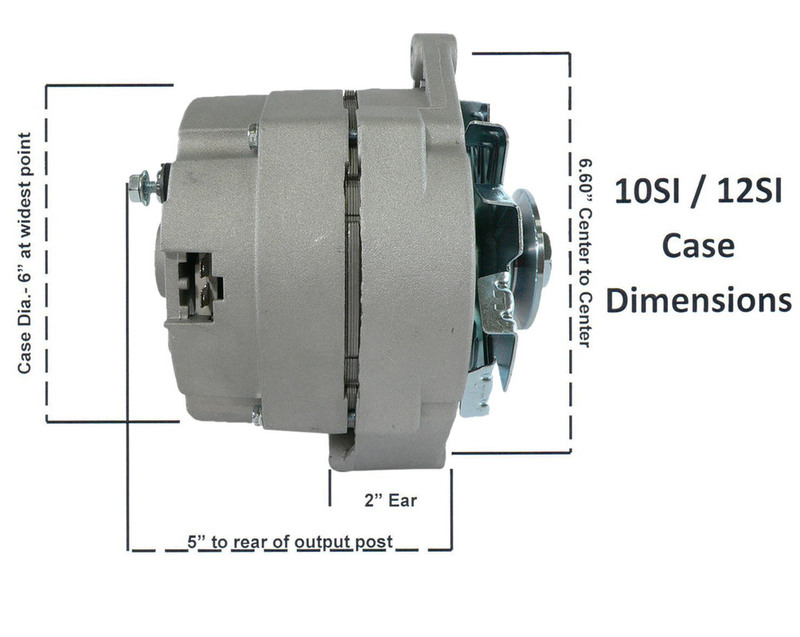 The GM alternator has the connector pins labeled with a #1 and #2 on the housing. 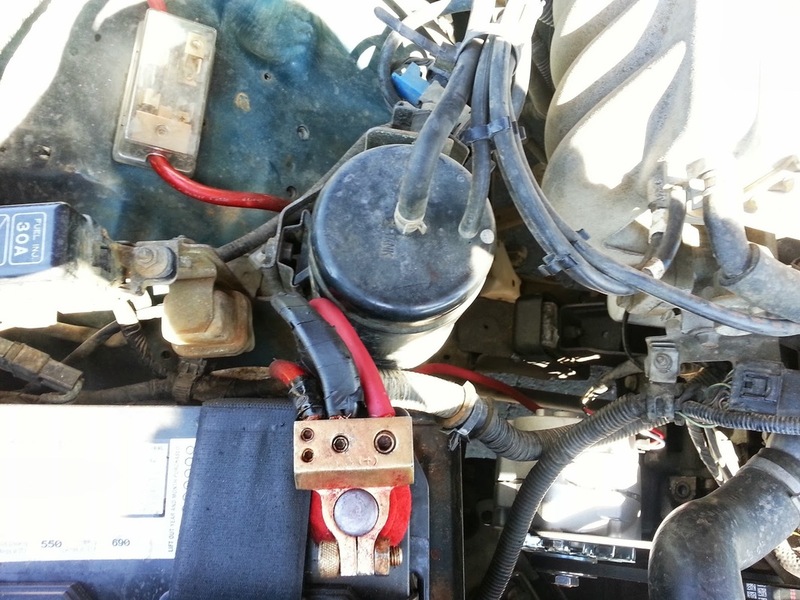 #1 (white wire on the new connector) is for the Ignition and 2 (red wire on the new connector) is your 12v constant. Strip your wires and slide on the heat shrink tubing, solder the wires in place and use a heat gun or lighter, to shrink the tubing down for a water tight seal. - white/red to RED... white/black to White. 12. Lower the new GM alternator into the engine bay - Remember you are installing it upside-down so the hole you drilled out earlier (the thinner mounting tab) will now be bolted through the lower bolt hole. Bolt it through and hand tighten the bolt/nut in place so the alternator pivots freely. 13. Bolt the &quot;modified&quot; adjustment bracket to the block, also hand tight. And use the new Long bolt, nut and washers through the top alternator mount bracket and put the new belt onto the alternator. The pulleys line up perfectly! my stock alternator belt is in the pic because I thought it would work, but because the pulley thickness is smaller it started melting the thicker stock belt. 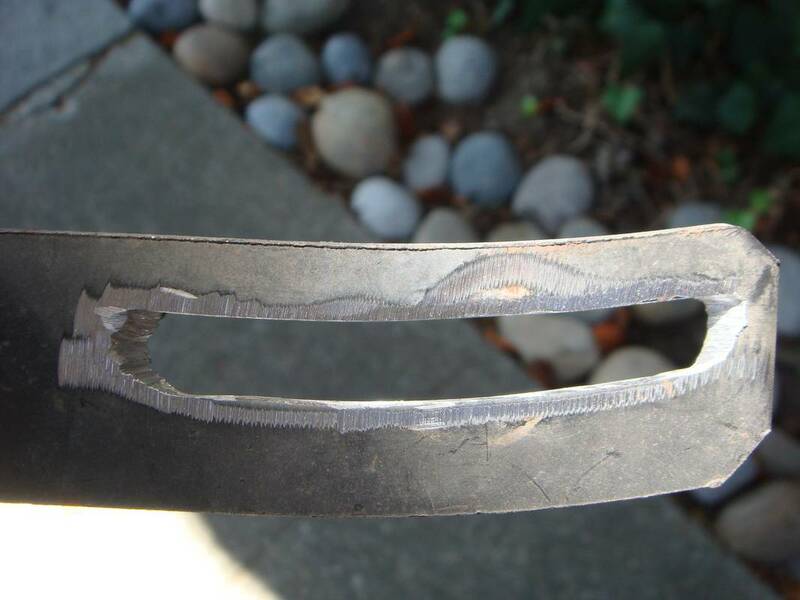 The thicker belt was melted and shredded by the end of the week. Don't use the stock belt and get the new thinner on belt at this point to avoid a headache down the road - literally. 14. You can now tighten the slider bracket to the block. 15. 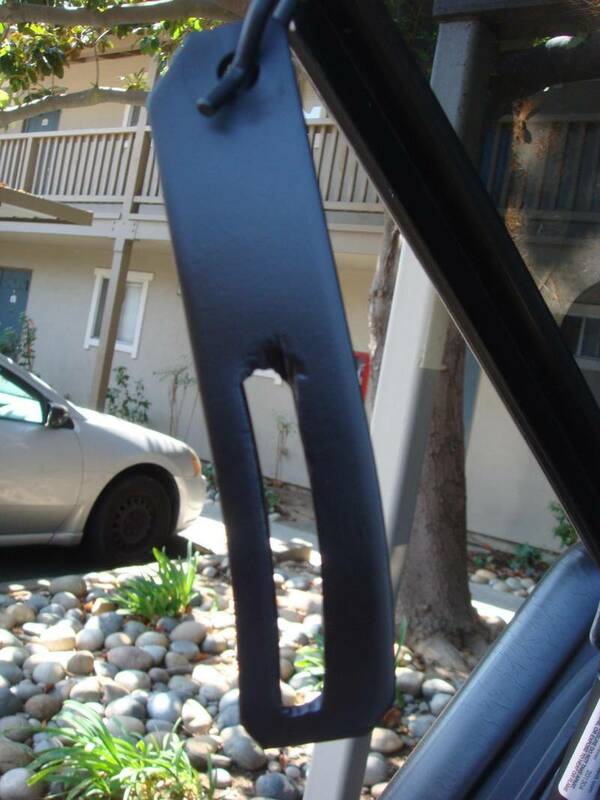 Use your pry bar or comparable prying tool to tension the alternator/belt and tighten all mounting bolts. 16. 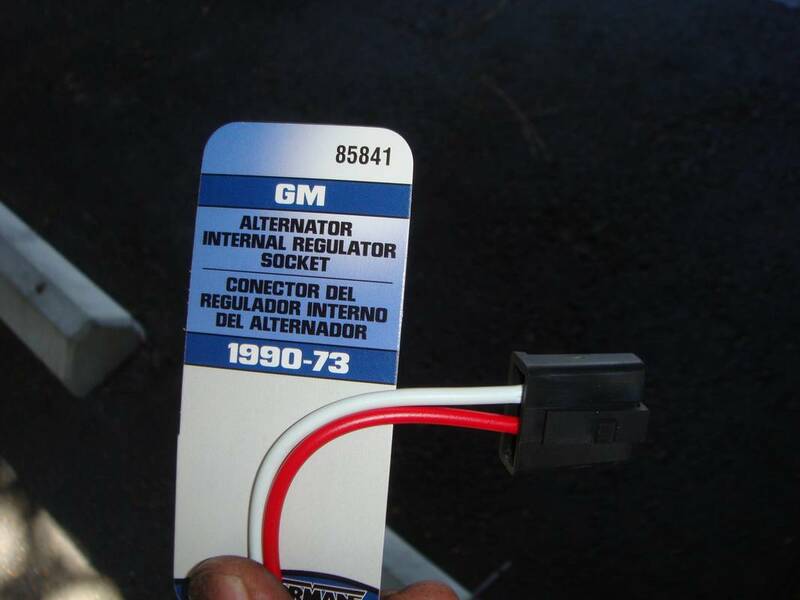 Plug in your new connector to the GM alternator double check that the wires are going to the correct pin. 17. 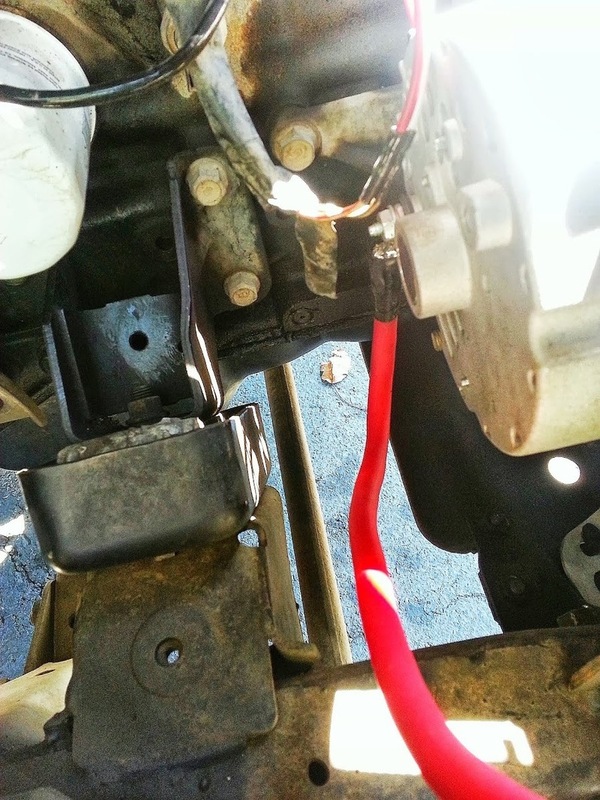 Bolt the Battery power wire to the alternator. I used the stock wiring for the bolted Power wire when I did this install. 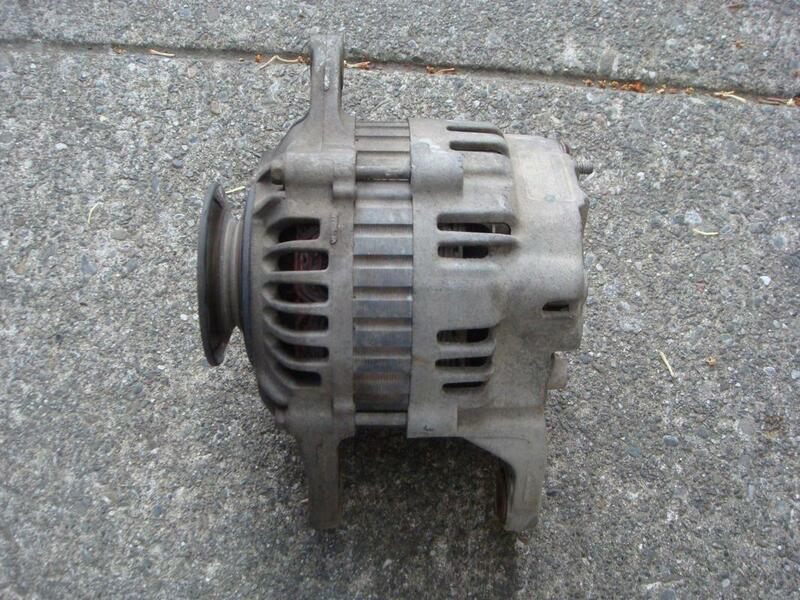 The stock plastic cover even clips into the GM alternator for the bolted wire. factory bolted battery power wire with plastic. 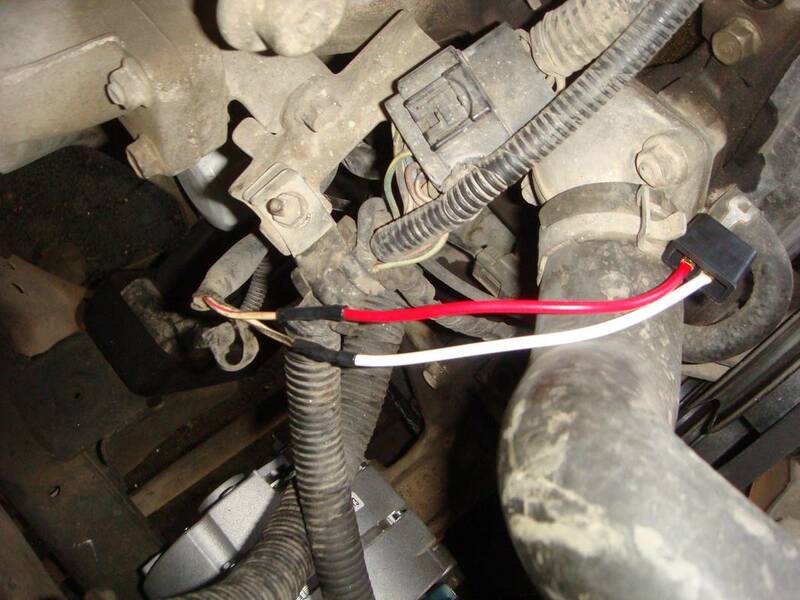 The right red wire is to my alternator and the left is to my sound system, center is factory to ign/starter etc. 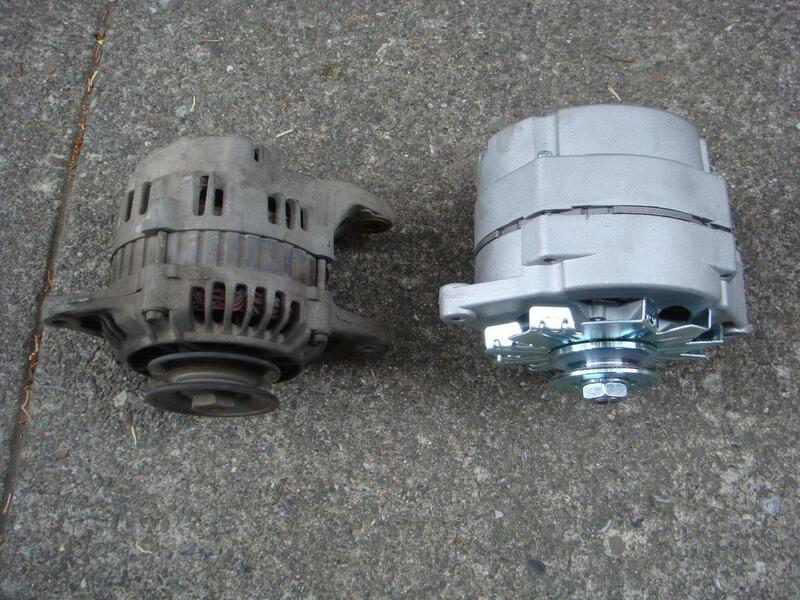 Also you can kind of see the thinner belt on the alternator in the pic below. 18. 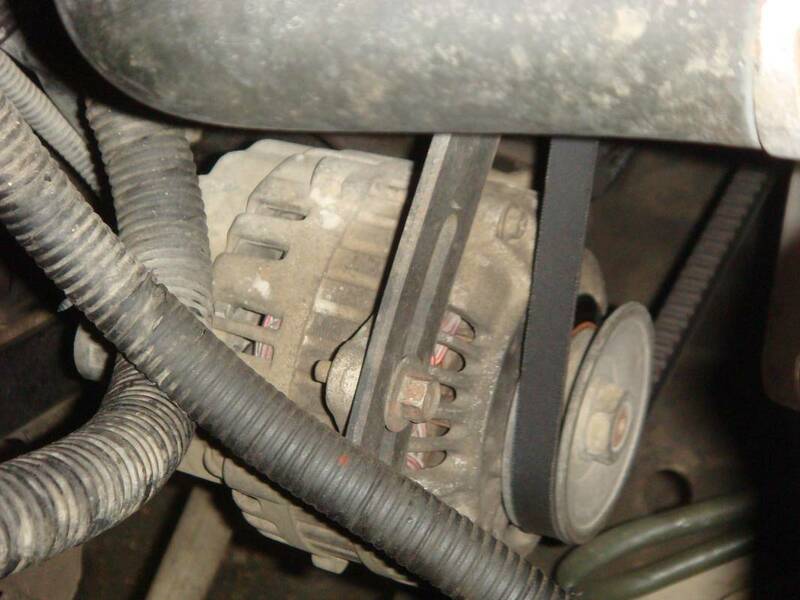 Re-install power steering belt if applicable. 19. Check all bolts are tightened on both alternator and PS pulley tensioner. No more dimming lights or power starvation!!! 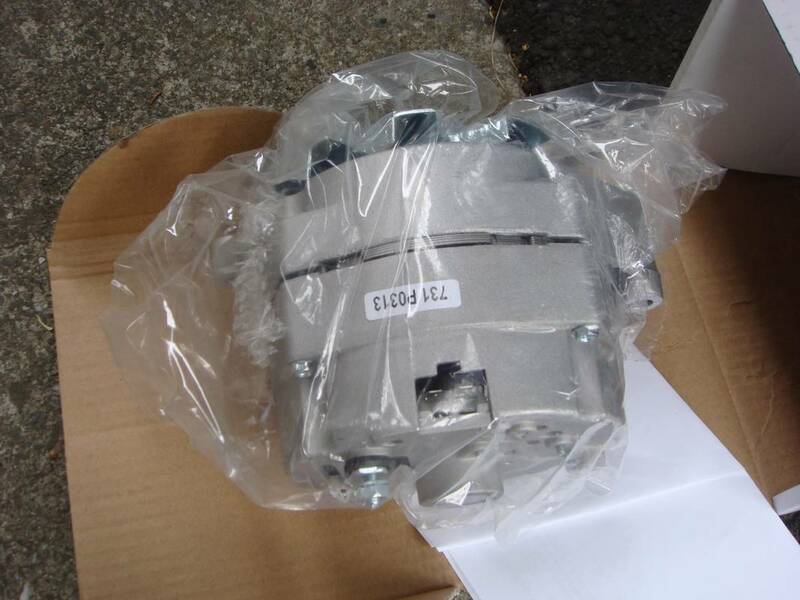 Here are some pics with info for the alternator. Please let me know if I missed anything or if you need help. I hope this helps whoever needs it. Good Luck! Epic man love the write up! 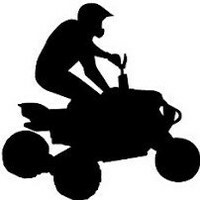 I will be doing this soon, finally got my power issues straightened out. Turned out to be bad wiring from alternator to the battery. 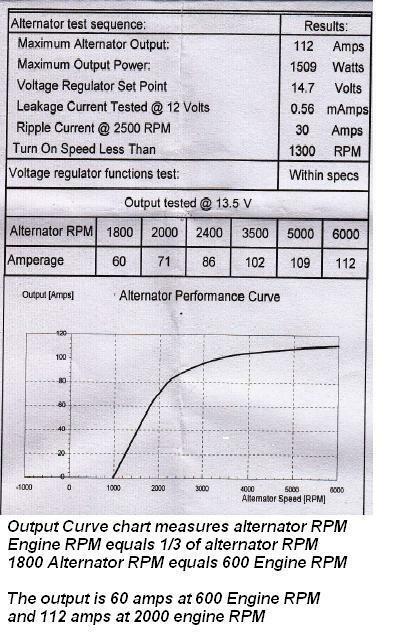 So my only question is would 8 gauge amp power wire be enough to handle the alternator load to the battery? I just have some left over from my stereo install and if so i will use it, but if not i can easily get my hands on 4 gauge. 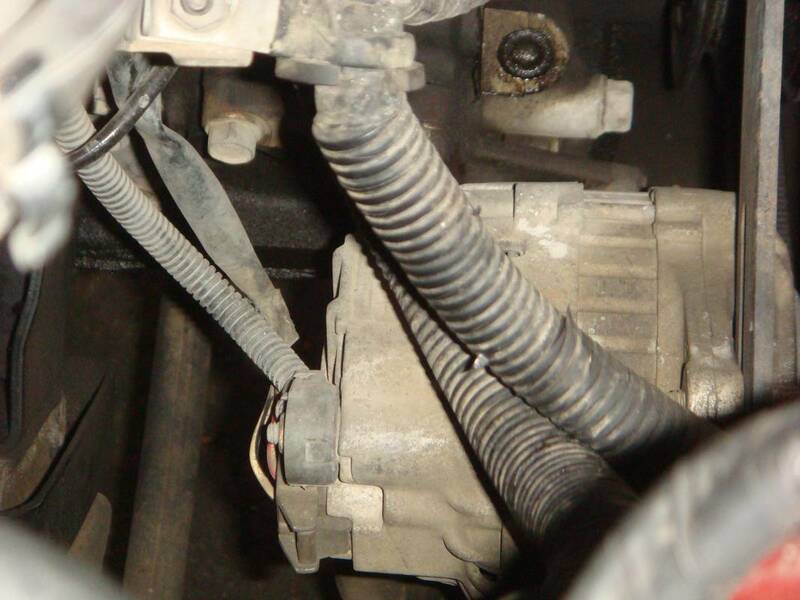 Also, this shouldn't be much different in the whole thing except for running the choke wire to a 12v constant ( Possibly to a spot on the ignition coil?) for the guys running carbs who want to do this. 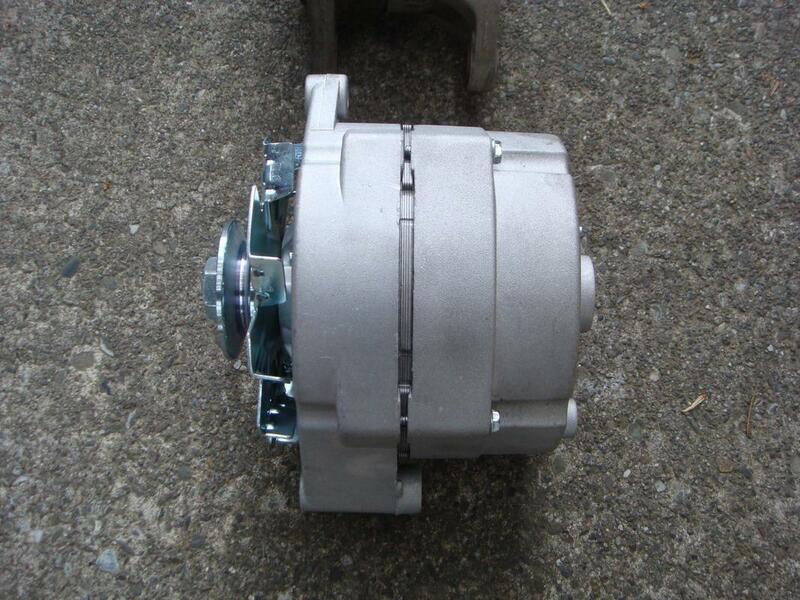 Thanks for the kind words, to answer your question about the alternator wire. Factory used 8 gauge at the alternator but it was thick copper wire inside that sheath. So replacing it with a same gauge but thinner muliti-wire copper core amp wire will have a better flow than stock. A bunch of thinner wires compared to a few thicker wires inside, the multi-thinner internal wire will have more surface area inside so it flows better. Go for it, it shouldn't be an issue. I hope that solves your no start problem. Thank you as well, probably gonna try the new 8 gauge wire today and run through my bundles as well so i can clean up the useless hanging wires haha. Comma Dude... for the love of all things holy, learn to use a comma! This thread should have a sticky. Good idea, this is a popular mod, it has been stickified!